If you regularly use heavy-duty cleaning products such as drain cleaners or heavy equipment cleaners, then there’s a good chance that you’re working with Class 8 corrosive substances. Many of these products rely on this harsh caustic effect in order to properly remove grime and residue, even if they’re are not labeled as such. That’s a problem. Class 8 corrosive substances are highly dangerous, and should be handled with caution. 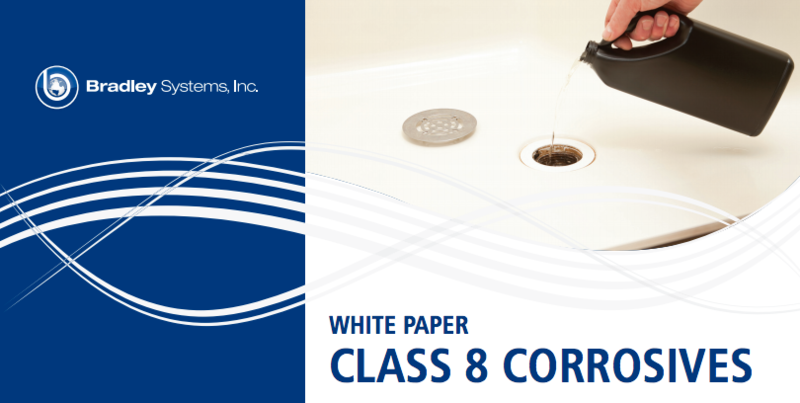 In Bradley’s new white paper, you’ll learn about which substances are considered Class 8 corrosives, how to train your employees to handle these subtances and other best practices that keep your workers safe. From shipping to storage to alternative cleaners, this guide has everything you need to understand how to work with and manage Class 8 corrosives.